In April and May of 1940, the Soviet Union carried out the mass murder of Polish military officers. Originally covered up and blamed on Nazi soldiers, it wasn't until the 1990s when Russia first admitted to the crime which ended with 22,000 officers buried in mass graves in the Katyn forest. Writer/director Piotr Szkopiak's grandfather was among those murdered and for 15 years he has been working on a feature film about the events which have come to be known as the Katyn Massacre. That film is The Last Witness. The movie unfolds a few years after the close of WWII. Alex Pettyfer stars as Stephen Underwood, a reporter investigating a string of mysterious suicides which he believes to be related. His investigation leads him to a refugee camp and a man with knowledge that the British Intelligence is trying to bury: the murder of 22,000 Polish officers. Adapted by Szkopiak from a play by Paul Szambowski, The Last Witness approaches the true events of the massacre and the surrounding cover-up through a fictionalized story which breathes life into a bit of history which has been buried for decades. Pettyfer continues to impress with a great performance as the intrepid reporter who is willing to risk everything to uncover the truth and he's supported by great performances from Talulah Riley who is, thankfully, more than just the love interest. Her character plays a central role in helping Underwood uncover the details of the cover up. 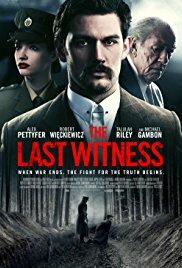 A drama charged with political intrigue, The Last Witness also offers a number of poignant scenes which bring the horrific events to light. I had a chance to speak with writer/director Piotr Szkopiak about the process of making the film. You can listen to the full interview or read an abridged transcript of the conversation below. The Last Witness will be available on VOD and Digital HD on May 29. My grandfather was executed in the Katyn Massacre and my mother was his daughter. The story came from a play that Paul Szambowski wrote. He researched Michael Loboda and he wrote the play based on that. When he saw the first film that I made, a film called Small Time Obsession, he came to me to adapt his play to a movie. And here we are 15 years later. When did the movie start to take shape and that you knew it was actually going to move forward? When Carol [Harding] got involved. I worked with Carol in television drama, she was my producer on a project, and we worked well together and when she got involved, she was very fired up with it. The first thing she did was go to the Berlin Film Festival and that's when she hooked up a Polish co-producer and that to me was the turning point because up to that point, I thought that Poland wouldn't be interested in the film because they know the story and I'm preaching to the converted there. I didn't want to make a foreign language film, I wanted to make an English language film that as many people could see as possible. I was really curious about your casting and specifically Alex Pettyfer who up until this point has made some interesting film but nothing really on this level. How did he become involved? What I really like about the actor and how it fell together is that I like to think that it's a fresh cast. It's not the same faces and I've always thought as a director that if you have faces that people aren't familiar with or actors that are doing things that are a little out of their comfort zone, you tend to believe the characters more and you get into the story a lot more. Alex was in a very interesting place because he's getting older and wants to do more mature rolls and I thought this was a perfect fit. How long did it take you to make the movie? You've been working on it for so long and then all of a sudden you get the call that the project is going ahead. How did that all come together? Pre-production has actually been going on probably for 15 years. When I was writing The Last Witness, I was very much writing it with one eye at how to produce it and how to direct it - at this point Carol wasn't involved yet. So I was scouting locations, trying to figure out how we could do it and where we could do it because as time goes on, all of the areas like the camp for instance, we were so lucky to find a camp that still exists, all that is disappearing very quickly or becoming modernized so I was kind of the clock. When Carol came to the film a lot of the locations were already found and I had already done a lot of the legwork. And then that carried on with Carol. Was there something specific that was particularly difficult to capture? The execution. That was very emotional. In that moment, everyone knew what they were doing and I felt the kind of weight of responsibility. Did that scene come early on in the shoot or did that come later? That was towards the middle of the shoot and it was a miserable day. It started raining in the morning and it rained all day. When you look at the pictures now it was a tough day but it was perfect for the scene. An action thriller called Winter in July produced by with Carol and a writer that Carol knows. The three of us wanted to make the same film. This is a story and an idea I had even before The Last Witness. Funnily enough, Carol had a very similar idea that she wanted to do and the writer had a very similar idea that she wanted to do so the three of us came together and come up with this story which is about a brother and sister on opposite sides of the law trying to find justice in a post-Brexit world where Europe is dealing with political extremism, nationalism, corruption. It's set in London and Poland.